Jim expands on lesson 2 and teaches several different picking patterns. He also covers the basics of muting. Chapter 1: (07:31) More Fingerstyle Action In the previous lesson, Jim showed you how to play the alternating bass pattern using your fingers instead of a pick. Plucked chords were also added to the pattern. Take this time to review the materials presented in the last lesson. Jim expands upon these concepts in the current lesson. When playing the alternating bass line in conjunction with chords, the chords were previously played on beats 2 and 4. If you always place the chords on these two beats, your rhythm playing will lack variety and will begin to sound stale rather quickly. For this reason, it is important to learn how to place the chords on other beats. Mastering this process will also increase the coordination between your brain and hands. The alternating bass line remains unchanged regardless of where the chords are placed within the measure. For example, Jim first shifts the chords to beats 1 and 3. Notice how the bass line remains the same. He demonstrates this pattern with an A chord. This chord is a good chord to a start with when learning this new pattern. However, it is important that you master the pattern with each chord that you know. The other chords in the key of A major (D and E) are a logical place to start. Note: For tablature to all of the rhythmic examples played in this lesson, open the "Supplemental Content" tab. The chords can be shifted to any permutation of two beats within the measure. Jim demonstrates how to play the chords on beats 1 and 4 for example. Placing the chords at the beginning and end of the measure gives the rhythmic feel strong forward movement. Practice this example as slowly as you need to at first. The most important aspect to focus on is keeping a clear, even pulse. Gradually speed up the tempo as you become more comfortable. The last available combination is beats 2 and 3. Practice placing the plucked chords on these two beats. Remember that the bass line still does not change! Chapter 2: (07:05) Basics of Muting When playing a bass line in conjunction with chords, Jim applies two forms of muting. When basic muting is applied to this rhythm pattern, a few specific results occur. Palm muting the bass line enables the listener to distinguish between the tone of the bass and the tone of the chords. When the sound of the bass line differs from the sound of the chords, both parts are more distinguishable and tend to stand out more. Also, the overall rhythmic feel has much more forward momentum when left and right hand muting is applied. One of the advantages of playing with a thumb pick is that it enables you to palm mute rather easily. Palm muting is achieved by lightly resting the palm of the hand across the desired strings. Your palm should rest just on the other side of the bridge. This allows the pitch of the strings to be heard with an altered, slightly muted tone. If you place your palm too far from the bridge, you will prevent the strings from ringing altogether. When practicing this technique, focus on imitating the palm muting sound that Jim is producing. Palm muting is usually applied to the three bass strings. However, there are many exceptions. Jim also applies some left hand muting to these rhythmic patterns. This is accomplished by very lightly lifting up the left hand fingers after a chord is played. Do not lift the fingers all of the way off of the strings. You only need to lift them enough to prevent the chords from ringing. This gives a marcato or slightly staccato feel to the rhythm. Practice all of these muting techniques with each of the chords that you know. I'm finding it helpful to say something like "yes"/"no" as I play - "yes" for the pinches and "no" for the single bass notes.... so for the second and third beat ones - it would be "no" "yes" "yes" "no" Enjoying these lessons. Thanks, Jim. [email protected]om CAN YOU EMAIL THIS WHERE I CAN GET A PICK LIKE YOURS, PLEASE!!!!!!!!!!!!!!!!!!!!!!!!!!!!!!!!! I don't like thumb picks. I prefer to just use my thumb. Is it necessary to play all the exercises with the chord changes at the fast speed before moving to the next lesson? You should be able to at least play them smoothly at a slow tempo. This is my first day at Jamplay and I ejoyed so much the class, is taught in a very easy way but requires a lot of practice. God bless you Jim. Thanks for this. AS someone who is fed up with Travis Picking, this gives me something to play with. Been looking for a lefty thumb pick (yes...there is a difference) with no luck...the big stores laugh when you say lefty. Anyone else stuck in the wrong hand world? Any ideas? I dont understand what bass strings you are picking because you didnt say the name of the strings every time, and every time it looks like you are picking different strings. If some body could type the sequence and order of the first excersize here that would help! Chava,,,,, the rhythm patterns are available to view or print in the "SUPPLEMENTAL CONTENT"
I know Jim uses a fred kelly slick pick, which are great. they are shorter and just so much better to play with. you can just trim it down with some scissors. i know a chap that did that and it worked. Another great lesson but am really struggling with the thumb pick, when i do the pinch im either making the d string sound too loud or if i lighten up on the d then my other fingers lighten up too to the point the g string makes no sound. Guess this is gonna take some practice. how much does your thumbpick go out from your thumb? cause the longer that is the higher you have to have the thumb so do you recomend some lenght or is it the same legth on all picks? Its to hard :D What is 1-4-5? Maybe this will help some folks. Find some folk songs in 1-4-5 and play them with these patterns. It's more interesting, it feels more like you're playing music, and if you have someone around who'll sing, it's a great way to practice. I've been playing Folsom Prison Blues to practice the syncopated pinch, Me and Bobbie McGee to practice the 1-4 pinch, and some others, too. This lesson completly screws you up as it the total opposite of the last lesson, "throw the thumb a curve ball" your not kidding, but we love Jims lessons and the hard graft that goes with them as i've played guiatr before and i realise it takes hard work to get where you wanna go, rock on Jim..
Keep working! It gets easier. Muting is still tough for me, though. Great to see Jim getting into some gooood stuff! The chord exersizes were good but now it's starting to sound like something. Go Jim! Fingerstyle guitar allows you to play the bass, harmony, and melody of a song all within the context of a single guitar part. This lesson serves as an introduction for Fingerstyle Guitar with Jim Deeming. Come on in and get started! Jim demonstrates a basic fingerstyle exercise that you can use with any of the chords you know. Jim Deeming explains how to integrate basic syncopation into your rhythm playing. This lesson is all about picking melody notes. Fingerstyle guitar really gets interesting when you combine bass, harmony, and melody. 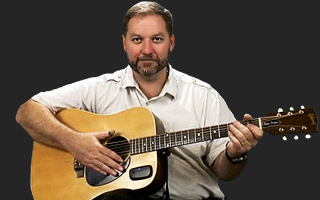 Jim Deeming teaches a fingerstyle version of the classic Civil War era song "Aura Lee." Jim explains key components of Chet Atkins' guitar style. Jim Deeming teaches a fingerstyle arrangement of "Bicycle Built for Two." He uses this piece as an example of 3/4 or waltz timing. Jim Deeming teaches a fingerstyle arrangement of "Yankee Doodle" and "Dixie." Both songs are played simultaneously! Jim Deeming teaches the basics of open G tuning. He also teaches a song entitled "Spanish Fandango" to show how the tuning can be used. Jim Deeming introduces a playing style called "Carter Family Style." The technique is also referred to as "Frailing" or "Clawhammer" style. Jim Deeming teaches the many wonders of DADGAD tuning. Jim Deeming tackles the topic of thumb independence. Jim Deeming teaches a more advanced version of the aptly named "JamPlay Song." Jim Deeming teaches a fingerstyle version of the classic song "The Wayfaring Stranger." Jim Deeming answers one of the most common fingerstyle questions, "which thumbpick should I use?" Jim Deeming presents his thoughts on how to properly grow and groom your fingernails. Jim Deeming teaches a fingerstyle arrangement of "The Entertainer," a classic piano song ported over to the guitar. Jim Deeming teaches the skills necessary to transform any song into a solo fingerstyle masterpiece. Jim talks more about arranging fingerstyle songs. This time around he discusses harmonization and chord inversions. Jim Deeming demonstrates alternate ways to play the CAGED chords that can be very useful when playing melody and accompaniment simultaneously. In this lesson Jim Deeming talks about a simple way to add harmony notes to the melody section of fingerstyle songs. This technique is quite simple and can add a whole new dimension to your playing.